I had to take a break today (Thursday) from cleaning out the kitchen. It's a once every 2 month thing to have to go through and reclaim the counters from the creeping pile of "stuff". Pull everything off and scrub the counters with Borax and then arrange the stuff that belongs neatly. It's noon and I've been at it since 9am and I still have the pantry to arrange. I grabbed this old ad for Hildick's Applejack and Brandy because I had never heard of this brand before. I did some research and came up empty so this is a brand lost to time. I did find it interesting because it represents a slice of the liquor market that quickly diminished to one brand, Applejack or Apple Brandy. 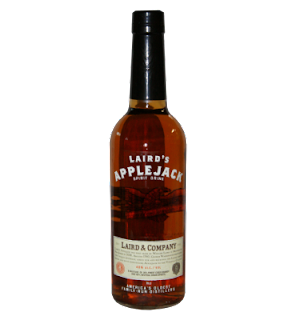 Today we are left with just one brand made in the USA, Laird's Applejack from New Jersey. I know it's amazing to think that apples are grown in any great number in New Jersey because most people's impression of that state is born from seeing Trenton or the Bayway Refinery off the Garden State Parkway. However there are large stretches of the state that are still farmland and orchards, not to mention the Pine Barrens, an almost impassible area of woods that is so remote it gave rise to legends like the Jersey Devil. Maraschino cherry or twist of lemon peel as preferred. wow old school cocktails -- lovely! thanks for popping by my blog -- i always love a good vintage and/or recipe site. happily returning the bloggy ♥ and your newest follower.